DailyWhitt: IT'S NEW TO YOU! Have you ever had something that was new to you, but old to everyone else? Maybe your first car wasn't the latest model. There was as much rust as paint, and the bucket seat felt like an actual bucket. 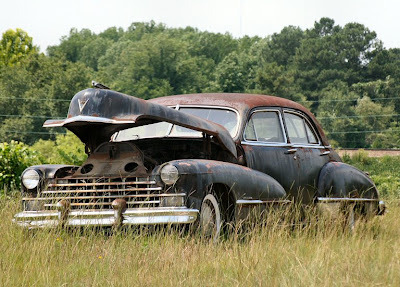 My brother used to pat his old Buick on the dashboard and say, "come on Betsy you can make it to the house one more time!" She made it two more times, before bursting into flame. This was the car God used to drive Adam and Eve from the Garden of Eden! GOD: Well... it's new to you! But the word of God promises that even though we are wearing out on the outside, on the inside we are being renewed day by day (2Corinthians 4:16). I think God gave us butterflies to remind us that change into something completely new is gradual, yet possible! The caterpillar already has all the butterfly DNA on the inside before it ever starts to transform outwardly! Hold on to the promise of new life, and new everything else in Christ! I do think some of that new life can spill over into the body. Look at the saints of old, and how strong they were, though old! Be encouraged with this brief list of just some of the new things you have in Christ! A NEW HEART AND A NEW SPIRIT! 1Peter 1:3 Praise be to the God and Father of our Lord Jesus Christ! In his great mercy he has given us new birth into a living hope through the resurrection of Jesus Christ from the dead. Jeremiah 31:31 The time is coming," declares the LORD, "when I will make a new covenant with the house of Israel and with the house of Judah. THE PROMISE OF A NEW HEAVEN AND A NEW EARTH!! !